There is a fine art to watching Jeopardy!, as any know-it-all could tell you. It used to mean shouting at the television (in question form) or turning to anyone within earshot, nodding and calmly saying "I knew that..." GameTek changes all that by giving Jeopardy! fans everywhere an opportunity to really buzz in. 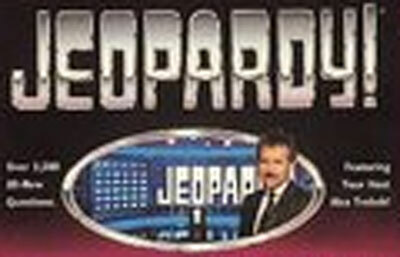 Alex Trebek hosts this all-new video game version of television's longest-running game show. Featuring the digitized television studio, theme music, voice and photography of Alex himself, this Jeopardy! takes full advantage of the graphic and sound capabilities of the Super Nintendo Entertainment System. With over 3,500 questions and answers (or is that answers and questions? ), it's sure to last many seasons without re-runs. GameTek's Jeopardy!, is the smartest game available on the Super Nintendo Entertainment System.